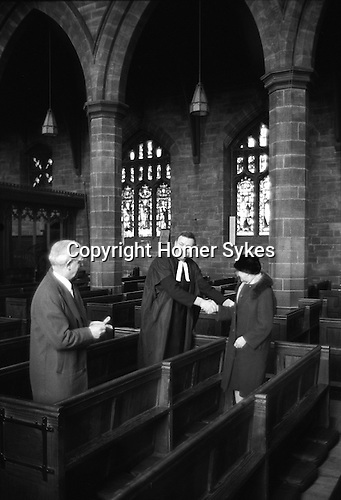 Henry Travice Charity, Maundy Thursday, St Mary the Virgin Church, Leigh Manchester, Lancashire England 1973. The Rev John Rogan MA, and one of his Church Wardens distribute the dole. On a pew west of the second pillar of the north arcade of the nave is a brass plate, marking the burial place of Henry Travice of Light Oakes, 1626, who founded a charity by which 5s. was to be given to forty poor people yearly on Thursday in Passion Week near his gravestone. Recipients have to walk the length of Henry Travice's pew, in 1973 ten people received a pound each. The Henry Travice Charity dole no longer takes place. Since 2013, the money has been given to Atherton and Leigh Food Bank, helping to feed the poor.